Do Dirty Blondes Have More Fun? I am back to the brewing pot….I went down to the new brewing supply store in Humble, TX and had them help me design a blonde ale for an easy drinking session beer. What we came up with has the name – “Dirty Honey Blonde”. I was going to go real simple but I was easily talked into doing a partial grain recipe. It takes a little more time on brew day but it should be worth the effort. The grain bill included Vienna Malt, Honey Malt, Biscuit Malt and Cara-Pils Malt for body. 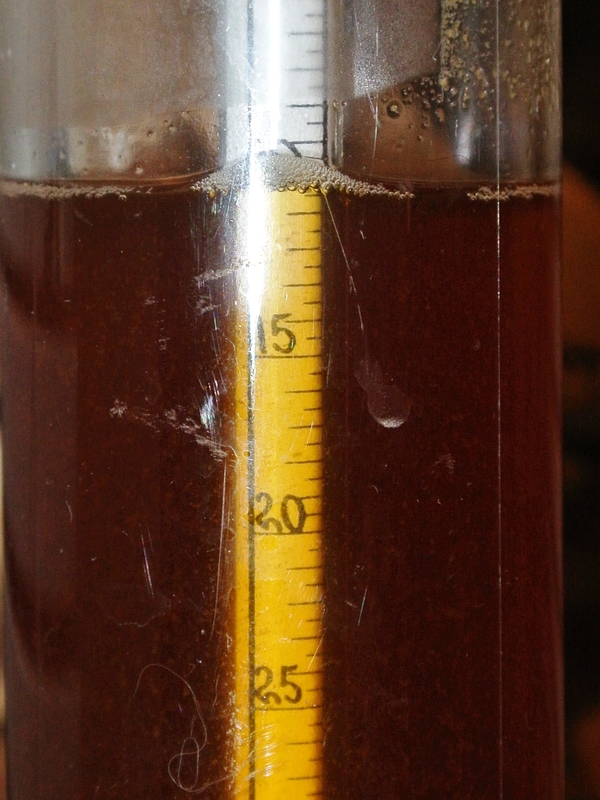 The extract is an Amber Malt…. One hitch in the recipe was with the recommended hops, Hallertauer….they were out so we subbed Cascade hops…..when I cut open the package for the hops my nose was hit with an aroma that immediately took me back to my days of drinking Olympia Beer in California…. it was one of those beers that was just a little outside of the taste range for most of the new-rookie beer drinkers. What I realize now is how much the good use of hops influences beer taste. As a young man it was more about cost…..a case of Coors in the bottles was $5.25 – still a hefty sum in 1969 but I couldn’t tolerate Brew 102…the cheapest beer we could get. Yes, the Cascade hops….very nice, the clone recipe for Oly also includes Willamette hops but then again Oly is a lager and I am making an Ale! I I did my darnedest to keep the cat hair at bay and soaked anything that came near the beer in Star-San!!!!! 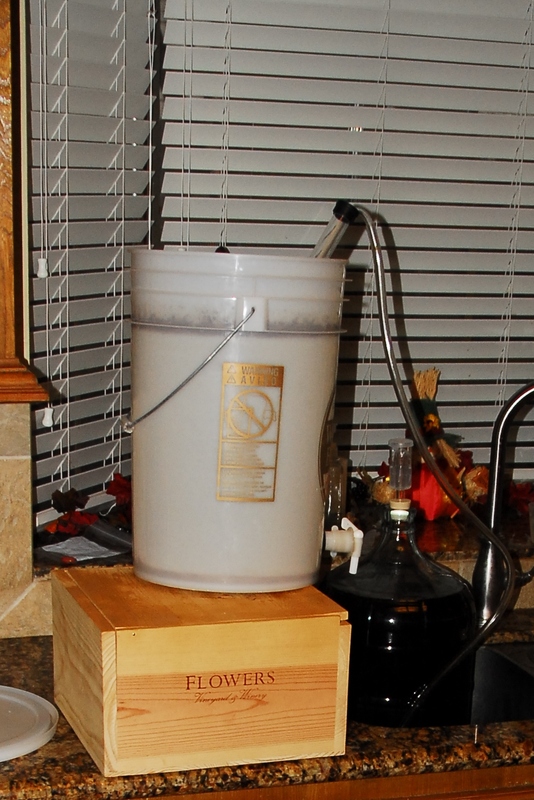 Mike, I am not going to lose another batch – It is into the fermenter now and it looks like it is off and bubbling. The OG is 1.047 – about what it should be and will wind up in the neighborhood of 4.8% ABV. A nice session beer. Color is a nice amber and a calculated IBU of 23.2 won’t make it real hoppy – that will make the bride happy. My Amarillo Ale is done and seems to have mellowed out. The Amarillo hops……not from Amarillo, TX, give the beer a definite citrus floral flavor. It has a bit of a grapefruit taste to me and Kathy says her buds pick up a hint of lemon. It slides down very easy. ABV of about 4.9% so it won’t whack you right away and the IBU comes out to about 58. The recipe claims – “somewhat dry ale with a strong floral-citrus accent” – and yes it fits the description. Thanks goes out to the folks at Backyard Home Brewers and Education Center in Humble TX. A couple of the beer blogs that I follow are written by women brewers…..and guess what, while I was in the store a young woman – I would say most are younger than me now!- she was in to grab some supplies to brew on the weekend. The owners are helpful and easy to work with… if you are thinking about brewing and live in the area check them out. They hold classes on a regular basis and usually have something to sample and rate when you visit. I am more than a thousand miles from my home brewed beer but I can’t stop thinking about the pleasures of lovingly hand crafted beers. I did a little search of Grand Junction, CO and asked the locals for some recommendations for good beer and a good meal. Our second night in Grand Junction, Colorado found us in the Kannah Creek Brewing Company. Good food, nice pizzas and hand crafted beers. I had the Lands End Amber Ale. Here is a description from there webiste. A 2010 Gold Award winner. My work partner on this trip is Pat McAdoo, he is a wee bit Scottish so he sampled the Scottish Ale charged with nitrogen for a very nice creamy head. He gave it it a strong thumbs up. If you like Whiskey….. they offer up a nice list of choices but saddly I/we did not partake…..next trip fer sure!!! American Bourbons, Irish Whiskey and ouf course Scotch Whiskey. Locals can walk away with growlers full of craft beer as well. If you are in Grand Junction it would be worth a visit. Tonight we are off to Naggy McGee’s Irish Pub….. or The Ale House or The Rockslide Restaurant and Brewery! So many choices and so little time. I may sample more than one or two….we fly home early tomorrow so I “should” behave! I will report back soon. For the future, my preparation will include scrubbing down the entire work area, strong cleaning measures for the equipment & bottles and keeping the air still – no cat dander or whatever it may be. I like my beer far too much to let myself become subject to beer-brewing malpractice! I received significant coaching from my better half two weeks ago as I bottled the Double Belgian Wit. She made valid comments and I was reduced to the simple and only right answer a man can give at that point – “Yes Dear”!!!! She likes her Belgian Wit and does not want it to not die a tragic death due to my controllable actions! In the near future I may consider a conical fermenter and eliminate the racking to the secondary all together. Maybe I should size up to the next size, this would allow me to make 10 gallons at a time and brew a little less frequently. Hmmmmmm – Not a big cost difference in equipment – I should also add a bigger boil pot too! I will write-up the AFE and see if I have adequate justification with the CFO to proceed with the capital investment. Better news in the next post…….. I hope!